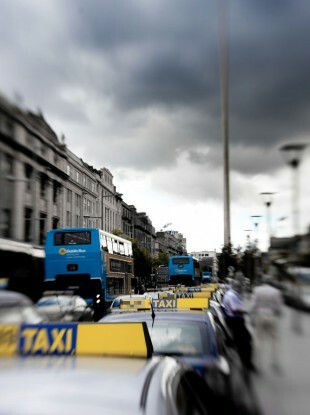 File photo of taxis on O'Connell Street, Dublin. REVELLERS, SHOPPERS, ANYONE who happens to be having a wander around a city or a few drinks in their local pub this Christmas is being advised to be on the look-out for rogue taxi drivers. Christmas and New Years is a busy period for taxi drivers, meaning unlicensed drivers are more likely to be active as they can blend in with the crowd. Taxi representative group Tiomanai Tacsai na hEireann is calling for increased enforcement of regulations to ensure these drivers are kept off the street. Chairman David McGuinness told TheJournal.ie that when the National Transport Authority’s enforcement teams are out checking cars, there is a a ‘noticeable decrease’ in the number of taxis on the streets. He noted that it would be near impossible to rent a taxi in the run-up to Christmas, such is the demand for vehicles. McGuinness’s advice to travellers is to either book a taxi through a company, or take one from a rank. The drivers at a rank tend to check the other taxis in the rank, so there’s much more of a chance that an illegal driver will be spotted. In 2013, the National Transport Authority launched an app that enables taxi customers to verify who their driver is, however McGuinness warned that it is not always reliable. Taxis are increasingly hailed from smartphones instead, using apps like Hailo. We record all journeys and send the driver’s photo and roof sign information direct to the user’s phone. Drivers must already hold a taxi license before they can access Hailo. Between 2013 and 2014, there has been a massive increase in the number of roadside audits by NTA enforcement officers, and also the number of fixed payment notices issued. These increased from 350 between April and September 2013, to 862 in the same period this year. “In November 2014, all SPSV Fixed Payment Notices were extended by legislation to members of An Garda Síochána,” a statement from the NTA said. Compliance officers will be working on two days over the Christmas and New Year’s Period, the NTA confirmed. Email “Heading out over Christmas? There might be rogue taxi drivers about ”. Feedback on “Heading out over Christmas? There might be rogue taxi drivers about ”.